The best EU and NA Smite teams are going to war. There's been a lot of fun, close-fought Smite played over the last few days. Thursday's placement matches saw a bunch of expected wins and one spectacular upset, as Latin American squad Licht overcame North American contenders Allegiance to earn their spot in the playoffs. Friday's quarterfinals saw the expected order assert itself, however, with a run of 2-0 series that saw the EU and NA first seeds progress along with EU second seed Obey and NA runner-up Luminosity. Today will determine which teams will advance to Sunday's $1m grand finals. Will we see a showdown between the EU and NA first seeds? Can defending champions NRG hold onto their title? See below for more on today's matchups. Check the official HRX 2017 site for up-to-date information on the schedule, as the semifinals are starting late due to a severe weather warning in Atlanta. Catch the livestream, as ever, on Twitch. NA first seed eGr have had a short journey to this point. As regional champions they earned a bye through the placement phase, and their quarterfinals was against China's HAPI. HAPI qualified off the back of a victory over Brazilian team INTZ having lost to Luminosity, and while they put up a spirited fight teams from outside of EU or NA have always struggled when put up against the best of Smite's most competitive regions. As such, eGr's form is hard to read definitively at this point. They'll certainly have a lot of fan support, however, as hunter Zapman's story is among this event's most heartwarming. He's one of the most venerable figures in the professional Smite scene, but has failed to make it to Worlds in both previous years. There'll be a lot of people cheering for him to take it the rest of the way. Obey's road has been longer but, so far, they've walked it with style. This band of talented EU players traces its lineage back to Titan, the Challenger League success story that defined the very first Smite World Championship back in 2015. At SWC so far they've played some smart, responsive Smite. They're the only team so far to really favour new god Nike, and they used her effectively in their win over Dire Wolves during the placement phase. Their performance in the quarterfinals against SoaR was very impressive, demonstrating that they have the ability and willingness to adapt. Against an aggressive draft they controlled the pace of the game well, building a steady advantage that delivered them a win. It was only in game two that they allowed themselves to play a little more freely, letting solo laner Variety off the chain in spectacular fashion. 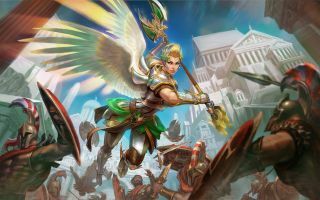 Games of Smite are often lost through mistakes that stem from too much bravado: Obey's demonstration of calm is a good sign. Even so, this is going to be a real test. NRG, formerly Epsilon, are the Smite World Championship's defending champions. The sponsor and the name has changed but the team hasn't: this is still the same highly consistent squad that won last year's big prize as well as the European Championship back in November. Like eGr, they received a bye in the first round and as such they've only played one game so far: a 2-0 win in the quarterfinals over Allegiance. That match suggests that, overall, they're in good form—but the second game was certainly closer than NRG will be comfortable with. Their strategic awareness and ability to build and sustain a gold advantage is impressive, and they're certainly looking like a championship-quality team, but NRG's first match wasn't an outright stomp: the right opponent could cause an upset. Will that opponent be Luminosity? There'll certainly be fans in Atlanta hoping so. Hunter BaRRaCCuDDa and support JeffHindla are former world champions and, as a Georgia native, BaRRa is a hometown hero. These two players are well-respected veterans of the Smite scene. Their teammates are less established, but this squad has logged victories over HAPI, SoaR, and LatAm hopefuls Licht already. They've shown a lot of collective and individual skill that bodes well for this tough matchup. There have been concerns about BaRRaCCuDDa's health—con flu is making its way around HRX 2017, and he is reportedly suffering for it—but this hasn't necessarily been apparent. After a weather warning-enforced delay to today's proceedings, there's every chance that the team will be back on full form. Either way, this'll be a contest well worth watching.